It is believed that the 2015 baseball season begins in a few days, but that is just a rumor. When it stops snowing, when the thermometer hits a reading above 35 degrees, I’ll believe it. There is one place, however, where baseball is officially on, and that is the Howard Whittemore Library in Naugatuck. It is a guarantee. You can talk baseball April 8 no matter what the meteorological calamity. First pitch that evening is at 6:30 p.m., and four local baseball authors will talk about the national pastime and Connecticut’s place in it. And batting cleanup will be former Waterbury Republican executive sports editor Don Harrison, author of “Connecticut Baseball: The Best of the Nutmeg State.” First published in 2008, “Connecticut Baseball” is now in its third printing. Kirk Morrison, reference librarian at the Whittemore, believes that hot stove talk is what area baseball fans need during this chilly start to spring. Our regional sports heritage has always brought out a crowd to sports presentations, especially at the Whittemore. This will not be Harrison’s first time there as a presenter. The latest version of “Connecticut Baseball” has a new design and features a photo of Waterbury native Jimmy Piersall on the back cover. “I like to know what the fans want to talk about, and what they’d like to hear, but I tell you, I have a few Spec Shea anecdotes that I am sure they will enjoy in Naugatuck,” added Harrison, mentioning the borough’s famed star from the New York York Yankees, who was known as the Naugatuck Nugget. Harrison will also “delve into Connecticut’s five natives who are in the Baseball Hall of Fame,” such as Waterbury’s renowned home run king, Roger Connor, and also the Hall of Famers who later made Connecticut home. Since we are talking baseball books, I need to suggest a new title for fans of the team that once played in Brooklyn. You remember, they were called the Dodgers. A new book was released last week, called “Tearin’ Up The Pea Patch: The Brooklyn Dodgers, 1953.” It is written by a former librarian at the Brooklyn Public Library who is also an old friend, Andrew Paul Mele. This is Mele’s third book on the Brooklyn Dodgers. There are two other themes explored by Mele. “The racial climate in the majors was still kind of shaky, and there were several incidents involving (Jackie) Robinson and (Roy) Campanella during this season, including one in the spring about (Jim) Gilliam joining the club,” said Mele, whose work is never just a retelling of headlines, but a history enlightened through contemporary perspective. 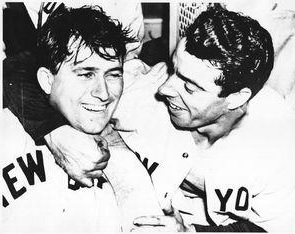 “The Giants-Dodgers rivalry climaxed in September when Carl Furillo dove into the Giants’ dugout and got Leo Durocher in a stranglehold,” Mele added. We just don’t have guys diving into dugouts any more. “And there are the human stories,” he said. “The Hodges story of his slump, which carried over into the 1953 season, and the guys living in Bay Ridge and being a part of the community. So there you go. You can spend an evening talking baseball at the Whittemore Library with local authors and also keep warm until the season starts with a book on the Dodgers of Brooklyn. The Whittemore lecture April 8 at 6:30 p.m. is free, but Morrison recommends that you preregister to reserve a seat. Call (203) 729-4591. For information on “Tearin’ Up The Pea Patch,” published by McFarland, visitwww.mcfarlandpub.com or call 800-253-2187. And keep that stove lit, please. Send comments to jpalladino@rep-am.com, and follow on Twitter @RAOffTheRecord.